I set off on a speculative trip to the Hartz today. Mt Wellington was pretty good yesterday, so I thought I'd see what the Hartz was like. Well, they don't clear the road as diligently as they clear the road to the Mt Wellington pinnacle. However, there are far fewer people, and the scenery is better, so there! I found myself pining for my dead Landcruiser. I chose the Liberty today, and it did OK, but I wasn't as free to choose my route or parking as I would have been in the 'Cruiser, or even in the nice new Forester! The ranger was there sorting things out, and it was a marvellous day. The sun was warm on the skin, and I may have actually got slightly sunburnt! In the end I parked at the Arve Falls parking area and walked from there. Managed to walk the plateau. The walking was very pretty today, if a little more taxing than it usually is. Once beyond the visitor shelter, the snow was quite deep in places, particularly just next to the boardwalk. Compared to a normal walk here, it was very heavy going. I must investigate snow shoes. Some people were walking in front of me, so I followed their tracks. I met them up the hill a bit, but they had only gone to Lake Esperance. Fortunately, a wombat had also been to the lake, and knew the walking track ahead very well. I followed his tracks for a while, until they wandered off into the scrub. The wildlife obviously use the walking tracks as a highway. A bit further along a wallaby had used the track, covered by a foot of snow, for several hundred metres. In fact between Lake Esperance and Ladies Tarn the going was quite good. In general, the snow isn't too deep. There were some lovely views from Ladies Tarn of the snow-covered range, and the partially-frozen tarn was very attractive. 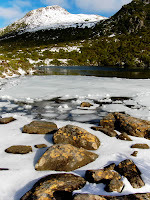 Having to be home around 4pm, I had to curtail my perambulations there, although in truth I wasn't very well equipped for trying to climb Hartz Peak across deep banks of snow, so the time limit was quite acceptable. Overall, it was a very enjoyable walk, but the floundering and falls in the snow were somewhat galling at times. My lack of coordination and balance in low-friction environments is quite obvious, and would have been amusing today if anyone was watching. I would have liked to see the various ranges around about from the summit, but I didn't have enough time. Progress was quite slow in the snow today. This view of Nevada Peak (L) and Snowy South (R) from the plateau was quite impressive though. 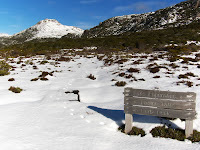 I had a quick visit to the Hartz Mtns, and thoroughly enjoyed it. 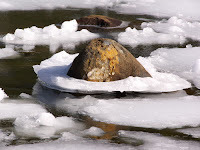 Your photos are stunning, especially the rock in the water, with snow and ice around it. loved that. I remember a small lake, and wonderful stunted native conifers. Forget exactly what, now. Perhaps King Billy Pines. They were like natural bonsais. Wonderful wild place. It looks very chilly, though.